Smooth the powder liberally onto your baby's skin, especially on the diaper area and reapply as needed to absorb dampness, being careful to avoid baby's face. 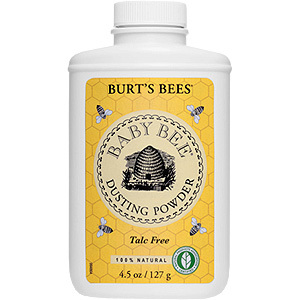 Smells wonderful, just like the rest of the Baby Bee line, but there are some gritty bits in the powder that are a little abrasive (this is the second time I've bought this, and it's been the case both times). 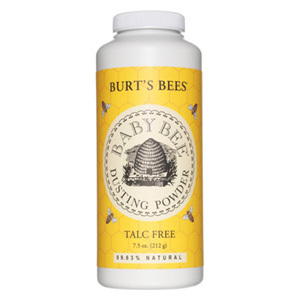 This powder works GREAT for keeping your baby's bum dry, and it has nice, subtle smell. Use this with BB diaper ointment and you'll get far fewer rashes. This dispenser is a much better alternative to the previous one they had, which was a dusting container that spilled powder everywhere. Anonymous "I will use Burt's Bees brand only"
After trying other brands of diaper rash remedies, this solved our little guy's bum troubles. He had a small spot of diaper rash, but it was very irritated. We used this in conjunction with the Burt's rash cream, and by later that day, everything had cleared up. We now keep a container in his bag, and at his Nana's house. I refuse to use any other brand on him. Michele "Higly recommend this product"
Call me an addict, this is great. Diaper rash-BYE BYE! The smell is sweet and light, which is a plus as well. Highly recommend this item. Anonymous "I love this powder"
A treat for after a shower or bath... I love this powder. Makes skin smooth, dry, and powder soft. Light, delicate and pleasant scent, perfect for babies and moms alike! Baby Bee Dusting Powder is shipped in a discrete, unmarked package. Orders are processed immediately and usually take about 3 to 5 working days to be received. We do ask that you try it for 2 to 3 weeks to feel the full effects. Any information received is used only for order processing and shipping purposes. Your information, such as e-mail address, will never be disclosed to a third party.